Can you fathom getting into $100,000 in debt within one year in business? This is exactly what happened with Kendrick Shope. In this episode, she shares us this story along with her love of spending and the lessons she learned along the way. Kendrick grew up in a very small rural town in East Tennessee. Her parents were both hardworking white collar workers – her mom was a school teacher and her father worked his way through a foundry to eventually buy the company. She had a great life with lots of opportunities including travelling to Europe. When her father decided to buy the company, he called for a family meeting. In this meeting he said something Kendrick would never forget: “Scared money won’t make money”. While she can’t say that it always served her, it did greatly influence her ideas about money. She shares how she never thought she had a money story until she got married. Then she had to live on a budget, and found it very difficult. As a married woman, she and her husband butted heads for years over money. Incrementally, she made some small shifts – make more money, which wasn’t always fun. She learned that saving is really nice for when the washing machine broke or the roof caved in… But then she started her own business, and used up all the cushion. 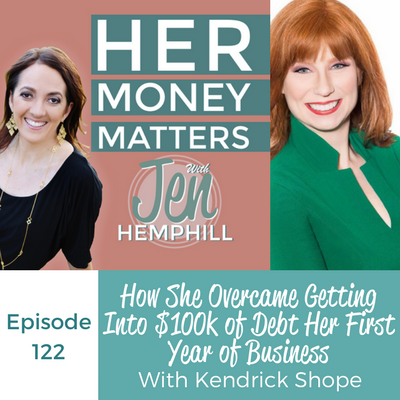 In the first year of her business, Kendrick fell 100k in debt. And the subsequent years were really difficult. But in her 5th year, she hit 7 figures. She and her husband no longer have debt, and have a nest egg. She understands the nest egg is important, and does not want to spend it. Kendrick shares her view that everyone is in sales – we all are in the business of persuasion. But men and women are different. Men typically like to sell through confrontation. They also like to be right. As such, men deal with finances differently then men. Women on the other hand, don’t want to rock the boat. They prefer to keep things amicable, avoiding confrontation. Kendrick shared a story of a woman who was a venture capitalist and used her differences with a room full of men in order to sell them on the dry bar to a group of bald men. Figuring out how you are different, play your strengths, and knowing the objections in advance will help you when negotiating a raise for example. Back in the day, women only had men to show them how to do things such as selling, marketing and business in general. And these were not necessarily the way that women would excel at. By women using their strengths and natural instincts, they bring something different to the table, and gives them more confidence in pursuing their goals. This week, the shout out goes to Christina for being so diligent about saving for her future car. She recently shared that she was going to purchase a new-to-her car with the cash she saved in her account specifically for this car purchase. Way to go Christina!